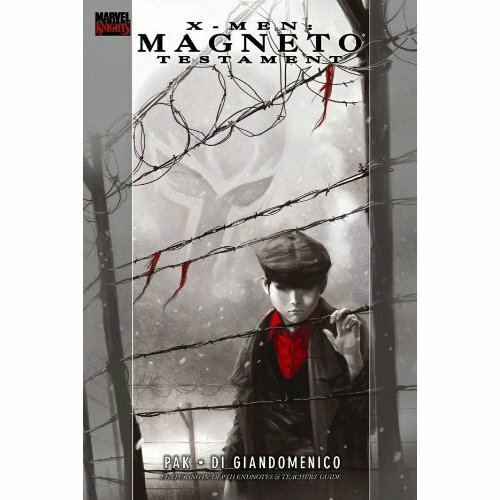 This coming Sunday is the start of the Days of Remembrance, so it's fitting that I just read the excellent X-Men: Magneto Testament. I came to this book by another route--that of researching writer and filmmaker Greg Pak's oeuvre, the same way I wandered into Planet Hulk--and I'm glad I found it. I generally have little or no interest in the epic soap opera that is the Marvel Comics universe (another exception: Joss Whedon's Astonishing X-Men run), but I have to give them props, especially in this book, for adhering to historical accuracy and their own fictional continuity. It's a high degree of difficulty squared, and Pak and his editorial team handle it very well. This is not a superhero story. It's not even a supervillain story. You could call it sneaky way to educate kids about the Holocaust using a comic book (or not-so-sneaky, given the big letters proclaiming INCLUDES TEACHER'S GUIDE on the front cover), but it's a good story any way you look at it. And speaking of the Holocaust... PBS is airing the 2009 BBC miniseries of The Diary of Anne Frank this Sunday (you can watch online starting Monday until May 11th). I've seen nothing but good reviews of this show.